Steak bites, green beans, tomatoes and mashed potatoes made a great meal on the trail! Don’t be lazy! Pre-packaged meals hold little to no nutritional value, you’re not doing yourself any favors by been cheap with your time; they do not fill you up very much either. Also, the meal aspect of a trip can take a crappy trip and make it exceptional… cooking on the trail is one of my favorite topics and things to do! Pasta, just add some roasted red pepper spice with some sun-dried tomatoes – easy and tasty (I usually add some onion and bell peppers). Vegetarian Chili – 1 cup red lentils, cumin, garlic, onion, chili powder and oregano, beef bullion, plus 6-12 sun dried tomatoes. Add 3 cups water on the trail, simmer for 10-15 minutes. (yummy even if you are a meat eater!). Shepherds Pie (oh yeah!). Pre cook ground beef then dehydrate. rehydrate with enough water to cover the dried beef and bring to a boil and sit… I usually add a package of gravy with extra water. next make some instant mashed potatoes, i also add some vegetables of some sort (few fresh carrots diced and blanched or rehydrate a vegetable mix.). Next portion out the meat mixture, next the veg and top with instant mash potatoes. Top with cheese (optional) and enjoy. Breakfast: Hard cheeses pack well with melba toast. Also try some Bulgar wheat, soak in water bottle over night with onion/garlic powder, cumin, and oregano (maybe some chili powder), salt/pepper, saute in a pan and add sharp cheddar cheese – saute until cheese is melted and blended. For desserts, make instant chocolate pudding (use powdered milk) in a zip-lock bag, crumble oreo cookies in the pudding and eat from the bag. Looking for a real treat, bring good chocolate with a tester bottle of triple sec/amaretto place in a small pan, place the small pan in a larger pan with water, bring to a boil and when the chocolate melts you have chocolate fondue. (what you’ve made is a double boiler). Bring biscuits or apples to dunk. Be inventive on the trail, it really impresses the people you are hiking with and if you are in a place with other parties at a campsite, you make them jealous and they view you as a back-country culinary expert! 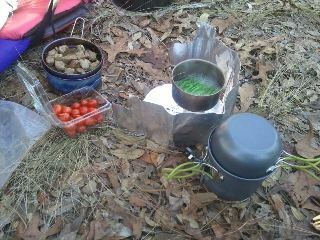 This entry was posted in Hiking and Backpacking and tagged backcountry, backpacking, meals, primitive chef. Bookmark the permalink.